How to change the width of multiple columns? How to change the height of multiple rows? 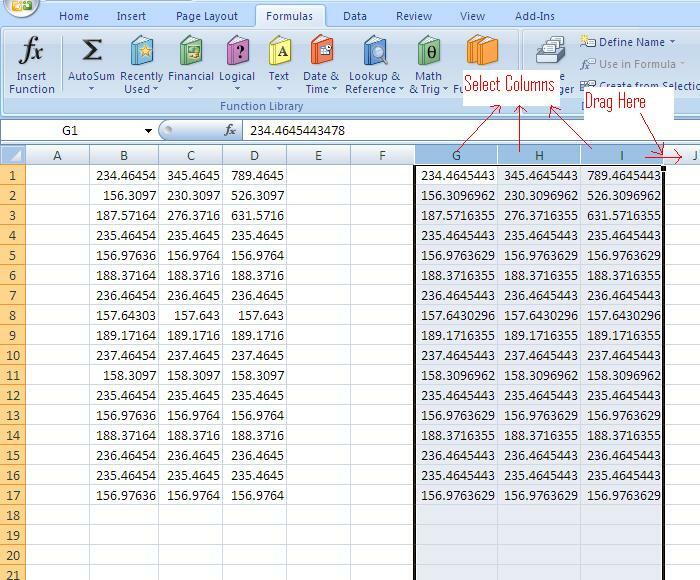 Width of multiple columns can be increased or decreased proportionate to the current available width using excel. For this select the columns to modify, then drag to right for increasing width or to left for decreasing width. Please refer to following excel spreadsheet to see how. How to adjust width of merged cells? How to adjust size of merged columns? How to adjust size of merged rows? How to equally change size of multiple cells? Previous PostPrevious How to handle error message “This workbook contains one or more links that cannot be updated” ? How to combine multiple cells in excel without losing data? How to delete all spaces in a selection (or how to delete spaces in a sheet)? How to handle error message “This workbook contains one or more links that cannot be updated” ? How to filter data in MS Excel? How to solve when filter function does not work properly in MS Excel? How to calculate interest rate in Excel for a one time deposit? Ctrl + Down (or any arrow) not working properly in MS Excel. How to Solve? Ctrl + Shift + Down (or any arrow key) not working properly in MS Excel. How to Solve? How to copy and paste only non blank cells in Excel? How to truncate fractions and convert decimals to whole numbers (value changed)? Ann Maria on Ctrl + Shift + Down (or any arrow key) not working properly in MS Excel. How to Solve?